Russian natural gas supply to South Korea will soon increase to 10 billion cubic meters per year, Interfax reported on August 18 (Thursday), 2011, citing Mr. Lee Jong-Kook, minister of the South Korean Embassy in Moscow. Mr. Lee spoke to the journalists about the energy related plans in the South Korean Embassy in Moscow. Two weeks prior to that, Russia’s Foreign Minister Sergei Lavrov and his Korean counterpart Kim Sung-Hwan held talks on the trade development and turnover between the countries. There the two ministers discussed a growing trade turnover between Russia and South Korea, which will amount to $20 billion this year, a record on its own, Minister Lavrov pointed out. 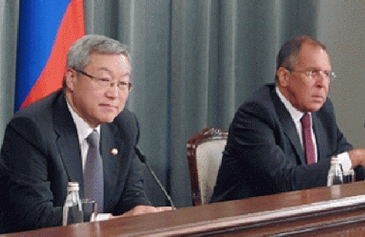 “South Korea’s investments into Russian economy are nearly $3 billion and will increase. We also discussed mutual projects in the fields of high technology, nuclear power, space, automotive industry, ship-building and electronics,” Lavrov said. Above all, the ministers discussed the energy projects that might soon become the reality. “We discussed the steps being taken in order to make it a reality for trilateral projects involving Russia, South Korea and North Korea in the energy and transport sectors,” Lavrov said. Northeast Asia and Asia in the whole is increasingly becoming important for Russia’s energy market. Russia’s natural gas and oil giant Gazprom has been holding talks on energy supplies with China for the past ten years now. China is one of the strategic consumers of natural gas and oil for Russia, but it is South Korea’s in Gazprom’s influence in the region is growing now. “The biggest areas of interest in Asia for Gazprom are China and India, but the negotiations with China has been going on for years now and yet there is no signed contract. Therefore, Gazprom will develop its cooperation with other Asian countries, such as Singapore and South Korea,” Ildar Davletshin, oil and gas analyst at Renaissance Capital told The Seoul Times. According to Davletshin, Singapore is a partner of Gaprom in the fields of marketing and trading of LNG, while Korea is a consumer with a growing economy that needs a lot of gas and oil supplies now. The fast-growing market in Asia is beneficial for Gazprom, since the European market is slowly assigning Russia’s oil and gas giant to the second plan. “Asian market seems to be promising for Gazprom, which is beginning to lose markets in Europe, so it makes sense strategically to diversify,” Ekaterina Rodina, oil and gas analyst at VTB Capital, told The Seoul Times. Rodina assured that the supplies of natural gas from Russia will increase, if the pipeline is constructed. As Russia’s foreign minister Sergei Lavrov announced after the talks with South Korea held in Moscow, that there is an oral agreement between Pyongyang and Moscow on the road map for a new gas pipeline. North Korea said yes to the construction of the pipeline between Russian Far East and its southern neighbor. It will become more beneficial for both countries at the Korean peninsula to have this pipeline built soon. “The prices for the gas import will decrease dramatically, while delivery time, stability and mobility will increase,” Rodina of VTB Capital said. North Korea is not a big gas or oil consumer that is why the experts say it will have other benefits, such as transit fees and that the project may bring more peace to the peninsula. “Often the construction of pipelines involves the third parties. Gazprom already has had such experience with Belarus and Ukraine. We can say that the gas transit through the North Korean territory will have a political significance and bring more peace to the region,” Ildar Davletshin said. “The role of gas in the energy markets of Asia is becoming very important in the contrast to the oil market. Gas will play a significant role in the region in the future,” Davletshin said. Lidia Okorokova serves as Moscow Correspondent for The Seoul Times. Previously she worked for the Moscow News, the Moscow Times, and the “Fusion” magazine in Dublin. She was a member of FEJS (Federation of European Journalism Students). She majored in linguistics and translations at Southern Federal University in Russia and received BA degree in journalism at Griffith College in Dublin, Ireland.